And since I haven't baked bread for a looong time, I decided to make pandesal. I first experimented on no-knead pandesal recipes for the past few days and the result were not acceptable. That's why I gave up and decided to bake pandesal the way I have learned it, well, without a dough mixer. 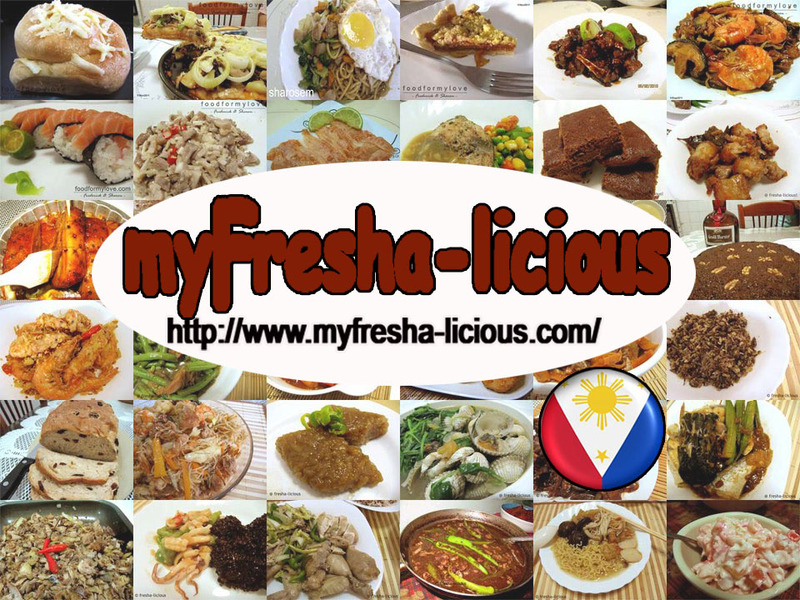 Pandesal is the quintessence of Filipino breads. Though this bread originated from the Spaniards, the taste has adopted and evolved based on Filipino palate and wherever there is a Filipino bakery wherever part of the world, there is pandesal and ensaymada and spanish breads :D.
Pandesal is a sweet-bread though not as sweet as most Filipino sweet breads. 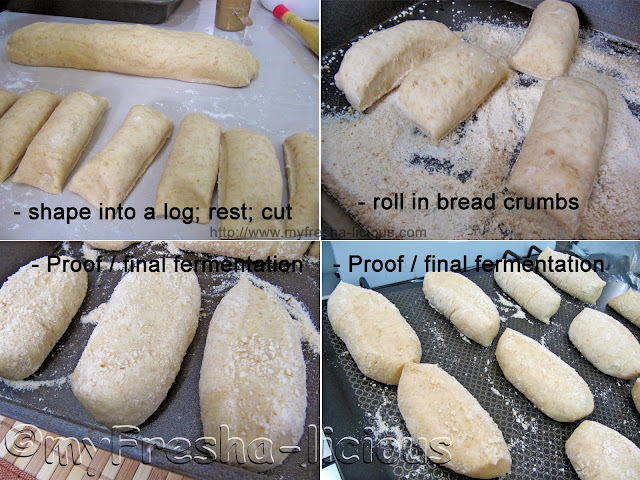 I am used to making pandesal the straight dough way using of course bread improvers. Bread Improvers refers to those commercial ingredients that enables a baker to create a soft sweet bread even without resorting to the sponge and dough method. 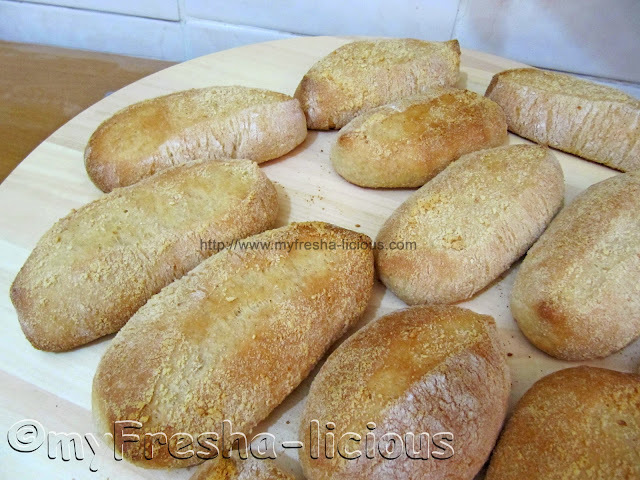 I also had baked pandesal using the sponge and dough method before, that's eons ago. I'm going to try that again, the sponge and dough method I mean, some other time. And so, after two unsuccessful experiments on pandesal using the No-knead dough method, I decided to give up and do it the most tedious, laborious, and muscle-bulging method of making pandesal - that is mixing and kneading the pandesal using my two powerful hands. I love baking breads but since I have no dough mixer, it is really difficult to make it :-( That is the reason why I had experimented on using the no-knead method. And since I failed twice, I decided to go for the usual manual way. For this pandesal I used a mixture of whole wheat flour and all purpose flour. It turned out the way I wanted it to be but my husband didn't like the whole wheat type so he asked me to use the plain flour next time. You see, my husband's concept of bread is- white bread only. The crumbs must either be white or buttery yellow, and if it is not a chocolate bread then it should not be brown. AND there should be no grainy things in it that are not nuts, raisins, or chocolate chips. 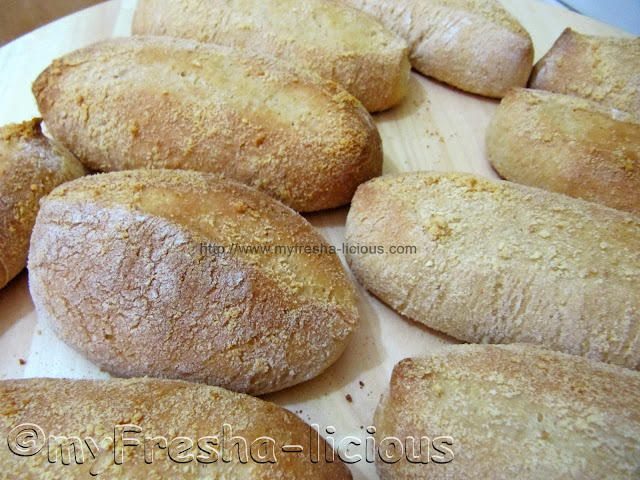 Why I made a whole wheat pandesal? Because it is healthier and higher in fiber. This is also one reason that my pandesal is not as soft as I wanted it to be. I used 70% whole wheat flour. May be next time, I'll try a 50-50 flour ratio. So we had to eat my pandesal right away. Keeping them for more than a day is not possible. It won't stay soft for a long time since I used the straight dough method without using any bread improver AND a whole wheat flour :-). Dough Scale : 50 g.
1. Using a spoon or spatula or a wooden spoon, mix together the flour, instant yeast and sugar. Add in the salt and mix well. 2. Beat the water and the eggs together. 3. Mix the butter with the dry ingredients, rubbing the fat against the flour. 4. Pour the wet ingredients and mix well. 5. Dust a working surface with flour and transfer the dough on it. Knead the dough using your hands for about 10 minutes. If you have a dough mixer or a good mixer for dough use that for better gluten development. otherwise knead the dough with your bare hands. If you are going to use a dough mixer, mix all the ingredients all at once : 1 minute at low speed then 5 minutes or more at high speed or until the gluten is developed. To check if gluten is developed: cut a piece of dough and stretch it with both hands if the dough doesn't break easily and if a thin plastic-like is formed in the middle, then the gluten is fully developed. 6. 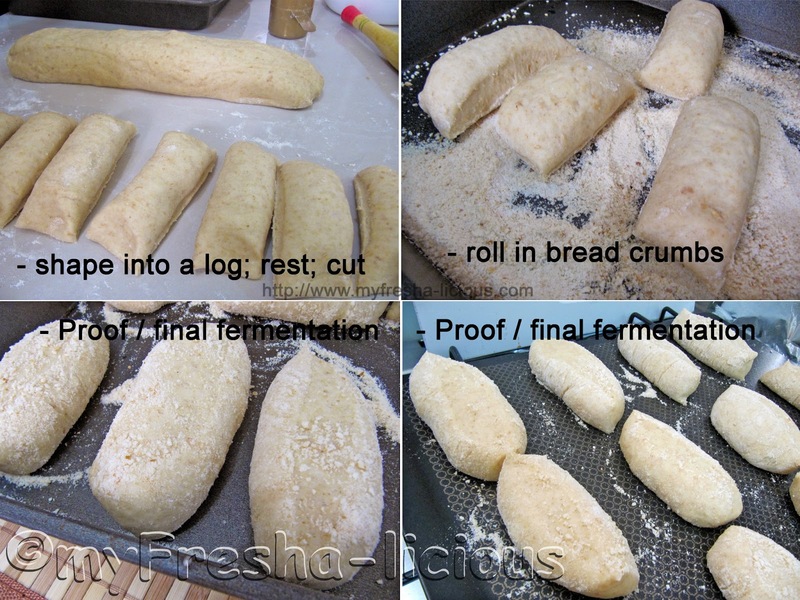 Cut the dough in 2 and form each into a log 1 ft long. Rest for 10 minutes. 7. Cut each dough-log into 1" thick, around 10 pieces each. 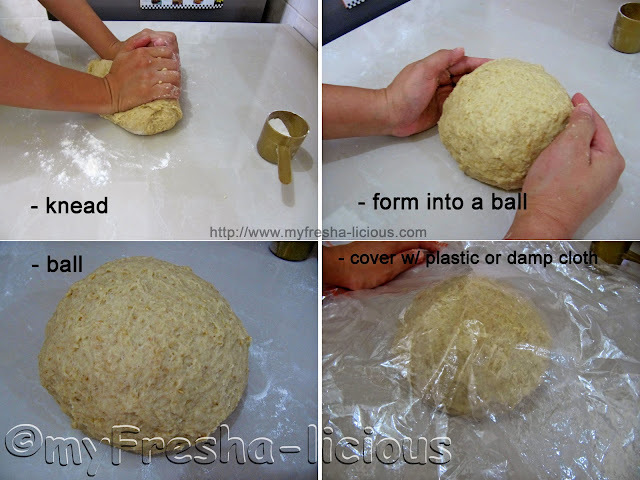 Roll each cut dough on the bread crumbs and place it on a baking dish. do this for the rest of the dough. 8. Proof for 60 to 90 minutes. 9. At least 15 minutes before the proofing period is over, preheat the oven to 180 degrees Celsius.